Well, looky here. I’ve uncovered more evidence my mom should have had her uterus yanked and never had kids. Here’s an old post I uncovered from her pathetic ‘mommy blogger’ days. Can someone crack a window? This reeks. (Originally published on momlogic.com) I enjoy playing games with my 4-year-old daughter Lily. Except one: Candy Land. If you’ve never played it, consider yourself lucky. The game can literally take hours as you pick cards and move your pieces on the way to … you guessed it: Candy Land — a sticky environment that looks like a sugary oil slick. Sure, you might get to meet Gramma Nutt or King Kandy along the way, but after that there’s nothing to look forward to … except for it to end. My daughter is literally addicted to the game. Hopefully, Candy Land isn’t a gateway game that leads to harder stuff (like Keno). Amazingly, the game has literally NO strategy, yet Lily has honed her Candy Land skills and has become something of a shark. It’s scary. And oh, yeah: It’s tedious as hell. 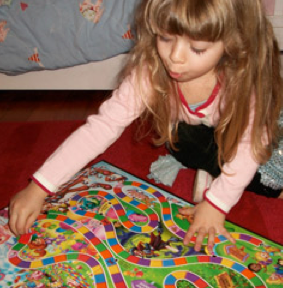 She is a Candy Land genius, so you never know how she might approach the game. Sometimes she moves her pieces backward instead of forward, and she often hops over from one path to another. Or — suddenly and without warning — she starts pretending that the board is bed and her playing piece is a baby and then proceeds to give it a bottle. With every move, Lily has to touch each space. EACH. SPACE. It takes forever. I know it’s all part of her scheme to tire me out. The thing she doesn’t realize is, I’m already exhausted because she gets up every morning at the crack of dawn. The worst part of the game — for her AND me — are the Lose Your Turn squares (the ones with the piece of licorice). When she does end up on the offending square, she does what any high-stakes game player would do: She cries. She’s bluffing, of course, but it works every time. The second I let my guard down, she’s rifling though the cards looking for one with a picture of a candy on it. Even Candy Land sharks have their limits. After about what seems like hours, Lily starts to get bored. She’ll then tell me (no matter where her piece is on the board) that she won. Believe me, I don’t argue. 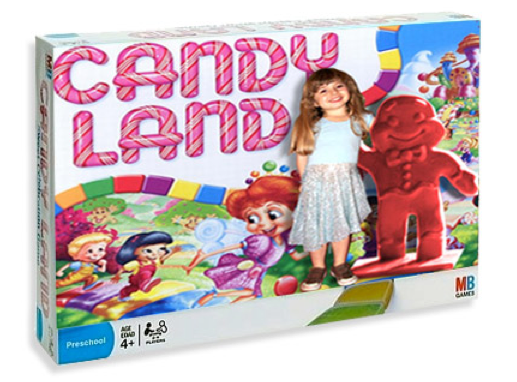 Tags: board games, candy land, games | Permalink. man do i love this sick blog. perfect. bravissimo.